Kat Millward, a nursing lecturer at City, University of London, has been awarded a prestigious Queen’s Nurse title for her work in providing high standards of patient care and nursing practice in the Camden and Islington community. The award ceremony took place at the Royal Garden Hotel in London at the end of October, and recognises and celebrates the achievements in community nursing and the dedication, the passion and the skills of nurses working in the community today. In particular, Kat received the award for her work with Camden & Islington Foundation Trust as a Community Matron for Physical Health within the Islington Early Intervention Service and Assertive Outreach teams. These provided support respectively for clients who had been recently diagnosed with a first episode psychosis and also for clients with long-standing and often poorly responsive enduring mental health needs who were at high risk to themselves or others if unwell. Kat was also involved in developing staff skills and confidence in managing physical health issues, supporting a small group of patients directly to improve their health, creating physical health resources to support staff and clients (including condition-specific care plans), and building and maintaining links with other involved organisations. In her role at City, Kat also teaches Clinical Assessment skills to post-registration District and Practice Nurse students, along with Introduction to Long Term Conditions module, and has recently taken on the role of Practice Education Lead for Community Placements. 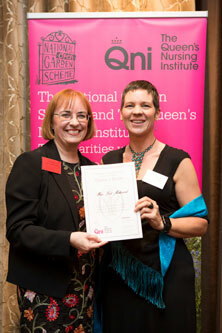 The event was hosted by Dr Crystal Oldman CBE, QNI Chief Executive, and Kate Billingham CBE, Chair of Council. The guest of honour was Professor Jean White CBE, QNI Fellow and Chief Nursing Officer in Wales.